Keep Nature Close To Your Heart. Decorate wood leaves with included markers. Leaves feature a hole in the stem for stringing. 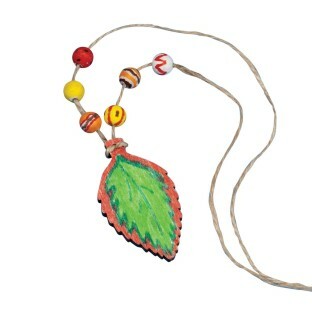 Finish with wood beads and hemp cord. A beautiful way to keep nature close to your heart. 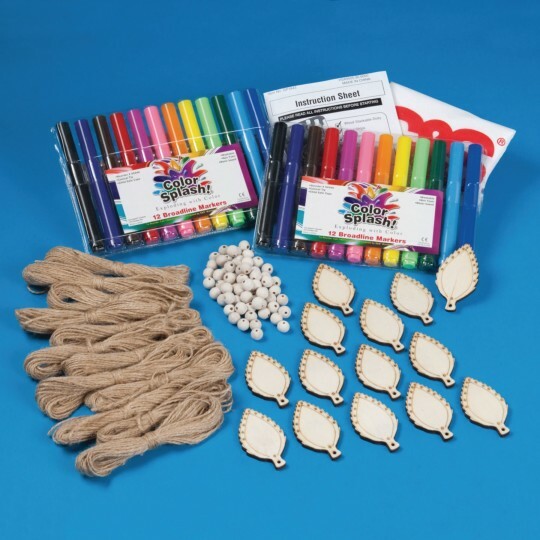 Includes 2-7/8" x 1-1/16" wood leaves with hole in the stem for stringing, wood beads, hemp cord and assorted markers. We really liked this product. We ordered enough for 48 children to do the craft but only received 47 leaf cut outs thankfully we only had 45 children attend the program. This is a pretty good project. They do warn you about the markers on wood being a little messy and they are messy. Maybe putting permanent markers in would be a good idea. We had kids and dads doing the project together and they all had a hard time threading the beads and leaf onto the hemp cord. Not a huge problem but something to look out for. Overall a good craft.